Sofitel Bangkok Sukhumvit - Where to stay in Bangkok for the first time? Sofitel Bangkok Sukhumvit - Luxury hotel - Where to stay in Bangkok for the first time? Where to stay in Bangkok for the first time? First time in Bangkok? Here’s The Best Place to stay in 2019! As a member of the esteemed AccorHotels family, Sofitel Bangkok Sukhumvit is synonymous with quality and timeless elegance. The hotel stands tall against Bangkok’s electric and diverse skyline, in the heart of the city’s premier entertainment, shopping and nightlife district, and the best area to stay in Bangkok for sightseeing. Upon checking in, guests can truly immerse themselves in the vibrancy of Thailand’s unique culture during their stay in one of the hotel’s 345 intricately designed rooms and suites. The décor, a fusion of colours and textures, from subtle touches of silk to delicate hints of cotton. In addition to the comforts of the guestrooms, and ideally situated in the best hotel location in Bangkok, Sofitel Bangkok Sukhumvit also boasts incredible facilities. Located high above the city streets is the outdoor swimming pool and breezy pool bar that offers all-day refreshments. The 24 hour fitness centre is complete with a hydrobath, and the Minerale Spa Bar features a collection of different mineral waters, fitting for patrons who want to unwind after rigorous training and exercise. The hotel also takes pride in its drinking and dining venues, with something to offer all gastronomes. The all-day dining eatery Voila! serves up delicious buffet selections from the early morning through to the late evening for dinner service. Le Macaron is an ode to the Sofitel brand’s French heritage, with a menu of sweet treats and scrumptious dessert confections. However, the true jewel in the hotel’s crown is the rooftop restaurant L’Appart, serving up the best of French Fun dining that can be enjoyed while sat against Bangkok’s sparkling night time skyline. 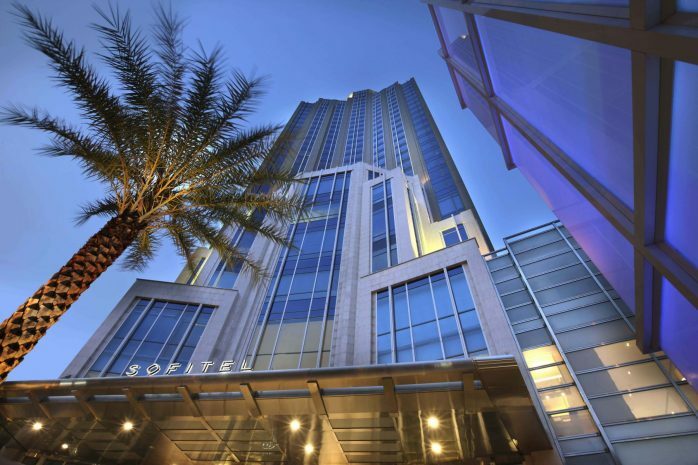 Sofitel Bangkok Sukhumvit has extensive connectivity, with a prime location on Sukhumvit Road, also recognised as the city’s ‘Golden Mile’. Easily accessible by Bangkok’s efficient public transport network, the hotel is located walking distance from both, Asok BTS and Sukhumvit MRT stations. Using these train lines also allow for access to the Airport Rail Link interchange. For guests choosing to travel by car, the hotel is only a 40 minute drive from Suvarnabhumi Airport. The hotel’s central location equates to hassle-free travel around the city’s vast metropolitan area and its many sights, making it a prime candidate for some of the best Bangkok hotel deals Sukhumvit based. There are many Bangkok points of interest that surround Sofitel Bangkok Sukhumvit, including some of the city’s most popular shopping complexes such as Terminal 21, that features unique local designers, boutiques and an incredible food court. Only a short train ride away are the CentralWorld, Siam Paragon, Emporium and EmQuartier shopping complexes, which have something for all shoppers, from designer labels to affordable international chains and quirky local brands. These centres are also a hub for dining, with choices that cover all types of international cuisine and Thai favourites, and from cheap-eats to Michelin starred fine dining. With so much choice, we promise you will never find yourself wondering what to do in Bangkok. Moreover, despite the day-time hustle of markets, heritage sights and buzzing shopping malls, Bangkok’s streets truly come alive once the sun sets. When it comes to things to do in Bangkok at night, you will be spoiled for choice! The city is home to an abundance of rooftop restaurants and bars, internationally renowned clubs, and themed cocktail bars running from Chinatown and the Riverside, all the way to glitzy Thong Lor, recognised as Bangkok’s equivalent to Soho. With so much to see, Sofitel Bangkok Sukhumvit want to give back to our valued guests. With our SO Cultural promotional offer, in addition to a stay in one of our luxurious rooms and a delicious breakfast to start the day, guests will also benefit from daily tickets for two to local museums, galleries and for cultural events upon completing their booking. We guarantee it is the perfect way to start your exploration of Bangkok’s many inimitable sights and attractions.